Three Chimneys Farm will stand eight stallions in 2019 with the additions of Grade 1 winners Funtastic and Sharp Azteca. The new arrivals add diversity to a lineup headed by Horse of the Year Gun Runner going into his second season at stud. 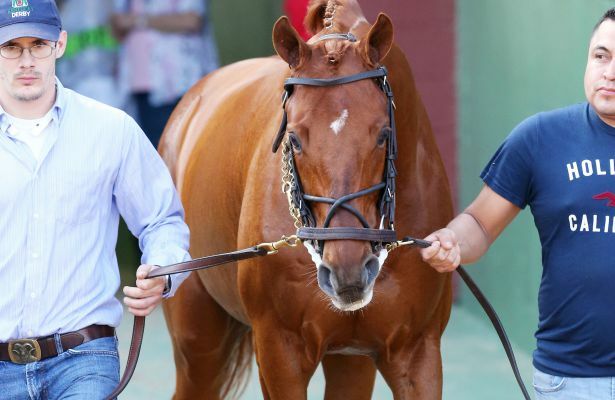 Gun Runner, who commands a $70,000 stud fee, finished off his career by winning five straight Grade 1s: the Stephen Foster Handicap, the Whitney Stakes, the Woodward Stakes, the Breeders’ Cup Classic and the Pegasus World Cup. He also beat older horses in Grade 1 company at 3 when he won the Clark Handicap. From the 171 mares Gun Runner covered, 64 were blacktype winners and 28 were graded blacktype winners. A good group of those mares are also proven off the track, with 51 producing stakes winners and 41 producing graded stakes winners. Mares Three Chimneys supported Gun Runner with include Love and Pride, who won the Personal Ensign (G1) and the Zenyatta (G1); Pure Clan, who picked up Grade 1 wins on turf in the Flower Bowl Invitational and the American Oaks as well as other graded stakes wins on both turf and dirt; and the Chilean-bred Wapi, a dual Group 1 winner in South America. Gun Runner, who was campaigned by Winchell Thoroughbreds and Three Chimneys and retired at 5, earned just shy of $16 million. Three Chimneys also campaigned Funtastic during his race career. While the 4-year-old proved himself on the turf instead of dirt, he has family ties with big names. Funtastic shocked the United Nations (G1) at 23-1 in gate-to-wire fashion, beating Money Multiplier and Bigger Picture. He added to More Than Ready’s talented crew on the track, which this year included Belmont Derby (G1) and Travers (G1) victory Catholic Boy and Queen Elizabeth II Challenge Cup (G1) winner, Rushing Fall. Funtastic, retired sound this year at 4, earned $410,711 from four wins in 11 starts. Sharp Azteca adds another element to the Three Chimneys roster: speed, and lots of it. The 5-year-old retired with eight wins from 14 starts and earnings over $2.4 million. “Sharp Azteca, he’s going over very well with breeders,” Nicholson said. “We’re really excited to have him here, too. He’s a big, beautiful horse. Good mover. Lots of bone. Has size and substance. He was brilliantly fast in 2017. Sharp Azteca earned his Grade 1 almost a year ago in the Cigar Mile, when he picked up his -2 ¼ Ragozin. Making the win even more impressive was his 5 ¼-length victory over Grade 1 winners Mind Your Biscuits and Practical Joke. One start earlier, Sharp Azteca was beaten only half a length in the Breeders’ Cup Dirt Mile by Battle of Midway. Funtastic will stand for $7,500 in 2019 and Sharp Azteca will stand for $10,000.